Suggest these changes to give these two rooms a more current vibe. Aside from equipment breakdowns, few phrases are more likely to provoke a kitchen or bath remodel than the phrase “this looks dated.” Styles and tastes evolve constantly. So, to help keep you up to date, here are six trends to consider incorporating when your clients say they want a fresh look. Color blocking—pairing opposites on the color wheel to make complementary color combinations—is common in fashion design. Now the practice is making its way to the home design space in the form of colored cabinets. Several Design Award submissions incorporated bold-colored cabinets. Sharp blues were a common color used in both kitchen and bathroom cabinetry. Barry Graboski, Senior Vice President of Product & Market Development – Kitchen & Bath, Wolf Home Products, said grays and blues have been gaining popularity on the classic white as the color of choice for cabinets. To appeal to the growing demand for colored cabinetry, Hastings Tile & Bath recently released a new line of vanities available in 35 different matte or glossy color finishes. There is a growing movement to integrate micro-waves and refrigerators more seamlessly into kitchen designs. Many designers are opting to place microwaves in islands or pantries, Florida-based design consultant Karinne Heal told remodeling. Another popular choice, drawer microwaves, currently offered by manufacturers such as Kenmore, Sharp, Wolf, and Bosch, promote open design and open up counter space for other elements. An appliance that’s much harder to completely hide, though, is the refrigerator. Large and bulky refrigerators clash with many visions for modern and open kitchens. One way to hide a refrigerator is by opting for a panel-ready or integrated model with cabinet panels that match the rest of the kitchen design. Additionally, smaller refrigerators, like the 24-inch Indoor/Outdoor refrigerator drawer from Thor, allow the appliance to be fitted under standard counters and mounted flush with cabinets. Quartz is emerging as a potential replacement material for porcelain or stainless steel in sinks. Many entries in the 2018 Remodeling Design Awards made use of the versatility, durability, and aesthetic appeal of quartz in sink apparatuses. Stainless steel has long been the most popular material for kitchen sinks, but the popularity of bowl sinks is lending itself to other materials, like quartz. This year, Kraus released a line of single- and double-bowl sinks made from 80% quartz. The Kraus sink is formulated to resist stains, scratches, impact damage, dirt, and grime, according to the manufacturer. Kohler and Elkayalso have single- and double-bowl quartz sinks available on the market, and Blanco has released a granite-based bowl sink to provide an additional alternative to stainless steel sinks. 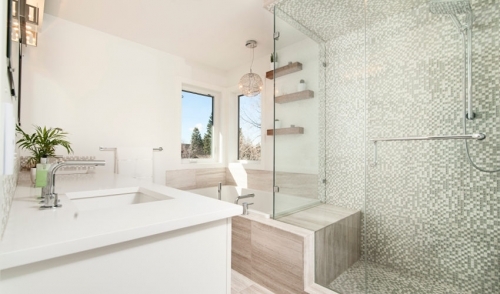 Amenities that satisfy homeowners’ desire for cleanliness are popular. Hands-free, touch-activated faucets emerged a few years ago. Now, lighting fixtures that kill bacteria may also be trending. Evolution Lighting recently introduced its Ellumi LED bacteria-killing light for under-cabinet lighting and as a shower-safe recessed retrofit. Evolution’s lights use LEDs instead of UV or chemicals, and the company claims they can combat mold, fungi, and bacteria on any surface. Metallic finishes on cabinet knobs and pulls as well as faucets can create an accent for any modern design. Manufacturers like Atlas Homewares and Mockett have introduced knobs and pulls for cabinets in several metallic finishes designed to create an air of luxury in a kitchen or bathroom. Moen has a brushed-gold finish available for several kitchen and bathroom accessories, including kitchen and bathroom faucets and cabinet knobs. New technology is allowing many interior amenities, like light fixtures and showerheads, to be made thinner to appeal to modern interior design. Franz Viegener has released the Thin Line, shower-heads manufactured using thin steel sheets stacked on top of one another to produce an overall thickness of just 4 millimeters. Franz Viegener Ultra-Thin Showerheads make use of similar technology. Grohe, California Faucets, and ALFI Brand all currently have thin showerheads on the market. In the lighting-fixture market, Nora Lighting recently released a surface-mounted Surf LED fixture designed to mimic the look of recessed light. The slim-line profile of the Surf LED is only inch thick, and the fixture can be installed over both standard and fire-rated J-boxes. Philips also has a thin LED lighting fixture available for residential applications.